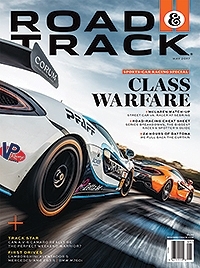 Pfaff Automotive Partners of Vaughan, Ont., made the May cover of Road & Track magazine for its intent to campaign the new McLaren 570S GT4 race car in this year’s Continental Tire Challenge racing series. “I blame J.P. Canton, McLaren North America’s PR director, for this,” said Pfaff Communications Director Laurance Yap. Pfaff Automotive Partners is an auto retailer founded in 1964 by H.J. Pfaff as a premium Porsche, Audi and Volkswagen dealership. The company has since added McLaren, Pagani, Singer, BMW, Chrysler, Mazda, Harley-Davidson and Toyota dealerships. The group is also heavily involved in motorsports. “Knowing that Pfaff was going to be supporting Motorsports in Action with their McLaren 570S GT4 effort, [Canton] reached out and asked us if we would be interested in being featured in a 570S ‘street car versus race car’ feature that he’d been pitching to R&T.